At the start of December I flew out to Colorado for 2 competitions. The first was a World Cup in Copper and then my first ever Dew Tour in Breckenridge. 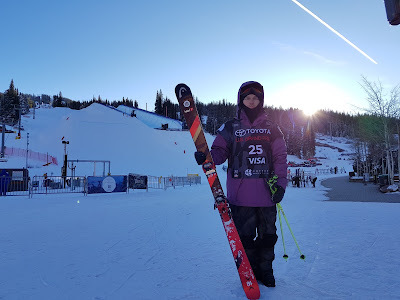 The competition at Copper was familiar to me as I have done loads before. But the Dew Tour was new. It was my first ever time being invited which was great! I felt like I was skiing well and my placing in the rankings was good so it was a nice little confidence booster to get an invite. It was a reward for putting in the effort and being recognised for skiing well. 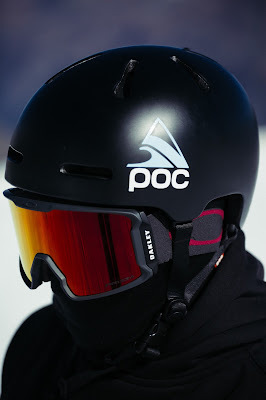 First up was the WC at Copper though. I wanted to do well in this so that I didn't have to go to an event in China. I was not keen to go as it was a fortune to go and compete and also not many people were doing it meaning that the points for the event wouldn't have been that good. Almost not worth the travel. But if I did well in Copper, I would be safe enough within the rankings to still be comfortable with Olympic Qualification to not have to go. I wouldn't be chasing the points. After a bit of trouble getting my bags I managed to get on my skis and do the pre-competition training. The practice is very short for how long a lap it is. It works out to be 4 laps an hour. Which is poor. But it was the same for everyone. Training went well for me. I put down a run I was happy with and I got rewarded for it. I finished up 16th overall. Which for me was a great result. I would probably say it is one of the best of my career so far. I was also happy that the result meant I didn't have to go to China. Next up was the Dew Tour. It is called the Dew Tour because it is sponsored by Mountain Dew the energy drink. It's an invitational competition. So you can't just enter. Which was pretty cool. It is probably the stage down from X-Games. I didn't go in with high expectations as I didn't know what to expect. I just wanted to go in and put down a good run and ski well. I think I did that to an extent. I finished up 17th which is similar to my result in Copper. But I didn't manage to do my run to the best of my ability. I landed my first run. But it wasn't great. The bottom section of it was pretty small. On my second run I fell on my last hit. I was really gutted about it. I could've placed better but I was still pleased to put down a run in a new event. I had a really nice time at home. It was very relaxed and still managed to fit a bit of training in. Would've liked to have done more. But a lot of facilities were closed. 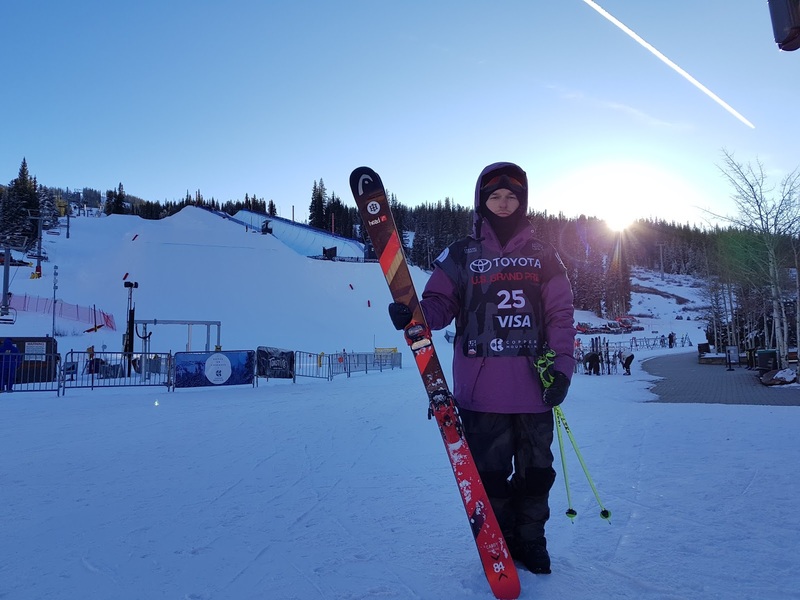 I am back out in Colorado now for another event in Aspen before heading to Mammoth for the last World Cup before the Olympics. I just need to keep my head down and work for another 3 weeks and then I will hopefully get some good news that I will be on the plane to South Korea for my second Olympic Games. So recently things have started to get a lot more hectic with the Olympics coming up in February. The media attention has increased massively and it is getting very exciting. I have been fortunate enough to be on the receiving end of some good press which is great. A lot of the media came in the space of a couple of weeks. I ended up doing all my green screen bits and pieces for the Olympics with Team GB and before I knew it I was on News Round, BBC Breakfast and BBC Sport. It was all pretty new to me and being on live TV all that was going through my head was don't swear. After the TV stuff I found myself doing a few interviews over the phone for a couple of newspapers. The first up was The Herald. I was interviewed by an ex athlete called Susan Egelstaff. She competed at the London 2012 Olympics so it was really cool to speak to someone who knew what it is like to go through the stress of qualifying and she was very sympathetic with the whole situation about being unsure if you are going or not till last minute. The Scotland on Sunday was next. It was a massive article that just came out recently. It was a longer one so it touched on a lot of things that I have to deal with as an athlete. Trying to juggle training and work, the inclusion of lottery funding and also the benefits of the Scottish Institute of Sport. I have really enjoyed doing all the media. And I hope I have the opportunity to do a bit more in the future before the games starts. Fingers crossed everything goes to plan and I make it! Last week I went to Saas Fee for a halfpipe camp. It was a private camp called Stomping Grounds and they have put on a few different parks around Europe throughout the winter. 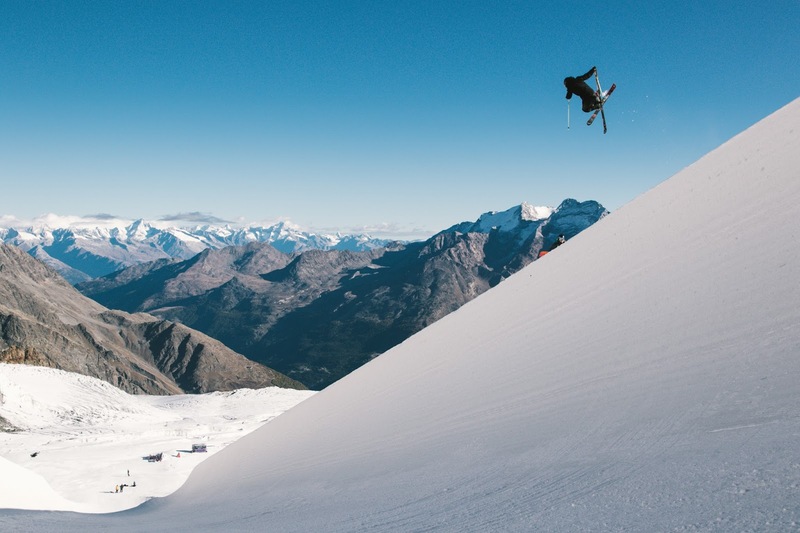 So in early October they decided to run their first halfpipe camp. 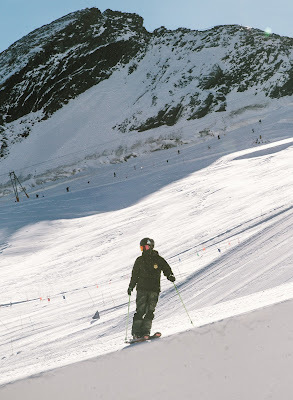 I am not the biggest fan of Saas Fee as a place. I don't think there is much going on off of the mountain and it takes an awful long time to get to the glacier. 2 gondolas and a train to be precise. 45 minutes up and 45 down. But. There is always a but. I was incredibly impressed with the park this year. The halfpipe was close to perfect. The lift lines weren't too bad and the accommodation was good albeit very expensive. The first few days are always rough just because of the altitude. You are skiing at roughly 3500meters so the air is very thin. I got into the swing of things pretty early on as I only had a week. Started off by doing a few tricks. Easing into it. Some 900's and some flares. Everything was coming along nicely. 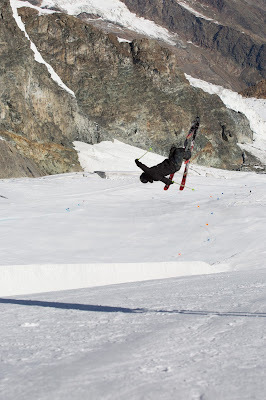 I went to Saas Fee with one goal. That was to land my right side double 900. There was a few other side goals along with that. Such as film a good few clips for a little project with Freeze Pro Shop. I was really excited to work with Lewis McLean and shoot some good stuff. Unfortunately day 3 didn't go to plan. I had spent the second day prepping the right flare. On day 3 it was great weather, the halfpipe was soft and very forgiving. I knew that the time was right to try it. I had tried 8 before now, and I had landed one. I knew that I would never feel totally ready, but in my head I knew I had prepped enough to do it. As it is a fairly new trick and a double I was scared and nervous. Which for me is normal and I think it is a good thing. It means I am not complacent. It didn't go to plan. On run 1 I took off slightly early and clipped the coping. I got the rotation slightly wrong but I got away with it. I was lucky. On try 2 I told myself all the things I needed to change. I prepped it in my head again and again. I had done all the right things. I made the mistake of rushing the take off. Big NO NO. I took off too early meaning I was sent over the edge of the coping and onto the flat part on top of the halfpipe. I landed on the coping and bounced into the middle of the halfpipe. My ski and 1 pole shot off as I crumpled. I think I got away with it very lightly. It could've been much much worse. On a positive note, my rotation was much much better. Just messed up the take off. I hurt my right knee pretty badly. Which was not ideal. It is still causing some problems 2 weeks later. But it doesn't seem like anything serious. Just a quad strain. Which is good considering the circumstances of the crash. Thankfully the mountain was closed the next day due to weather. So I felt like I didn't miss out on too much. After the mountain was closed I had one more day to film with Lewis before he headed back to Edinburgh. I managed to get back on my skis but I wasn't able to do much at all. My knee was really unstable but I did some airs just for photographs. I felt bad that he had come all that way to film me for a project and I had hurt myself and was unable to do anything. It was like I had just wasted his time. The only saving grace was that it added to the story a bit as it is not always clean skiing. It is a dangerous sport and people do get hurt all the time. Sometimes it can be a lot more serious so I was fairly lucky. Overall it was a great trip. I had a great time and although I didn't get as much as I wanted from it I still managed to get some small things. Progress was made and it was well worth it. The end of season was time for the Brits and a bit of spring skiing. I was out in Laax from the end of March till mid April. I had the best trip of the whole season. It was amazing weather and a lot of fun with my friends. The first week I was out it was just a bit of skiing. The second week was the British Champs. After a long season of competing I decided I wanted it to be a fun end to the season so I just had a cruisey run in the contest. The first week was really productive for me. I managed to learn a couple of new tricks including the start of a new double. I ended up trying 3 and landing 2. The last attempt didn't go so well which was unfortunate but I was happy I was on the way up the ladder. That was the main reason in me going out to Laax was to progress and try and learn some new stuff for my run. Which I thankfully managed to achieve. Overall it was a great spring and I am hoping for more of the same in the summer. There is a few camps coming up. The first in Les Duex Alps in France and then one in NZ for another World Cup. At the moment I have some time at home to work and also get back in the gym. Rolled into Sierra Nevada on the 13th of March and it was dumping with snow. The previous week had been glorious sunshine and almost summer weather. But since it was another contest the weather was destined to be rubbish. The first training was cancelled due to winds up to 80km/h and heavy snowfall. The second day it was slightly better but the wind was still high. It didn't cause to many problems at practice though. The pipe was great. It was the most fun halfpipe all season. It wasn't too long and it was very forgiving. I really enjoyed myself. I tend to get a lot from practice when it is limited training before an event because the pressure is on and I just have to get my head down and get my tricks down. The conditions for the contest were fine. No complaints. It was a night event which was cool as I hadn't done one since the Olympics. Practice went well. I managed to land a safer run and a harder run. There was no point really in doing a safe run because it wouldn't make much difference. I did what I usually do and had 2 goes at doing a hard run. It went really well. I ended up 16th with a score of 67(ish). Which was a good score. I was pumped to finish the season as top Brit. I also managed to get a switch 10 in my run at the end which is a relatively new trick for me. So it made it even sweeter after crashing hard on it in practice. Next up is some spring skiing in Laax and the British Champs.